I spoke about touch screen walls sometime back here. Although still in its formative years, using Microsoft Kinect and a household projector, presentations suddenly became a lot more “magical”! Taking it a step further, PointGrab recently introduced the Hand Gesture Recognition Software (HGRS) using a standard 2D camera. Based in Israel, Pointgrab introduced two new mobile (encompassing both tablets and smartphone) apps – CamMe, for gesture based photography and PlungaShot, a gesture based bow and arrow game on February 25th 2013 at the Mobile World Congress in Barcelona . Again, it is in its nascent stages, but the possibilities are amazingly abundant. Primarily in the presentation area, this could become a game changer, with its ability to deliver presentations from a distance without a remote control or aid from a colleague. I personally downloaded the CamMe application, both on my ipad and iphone. For long I was searching for a decent app, with the with the ability to perform time- based photography. Although a bit buggy right now, CamMe takes things even further than a timer-based methodology, to snap a picture a second after you asks it to, from a distance. With its SDK being open to application developers, I can very well see this being picked up by the imaginative elite to develop games, customized user interfaces, what all and what not! From gestures we go to telepathy! 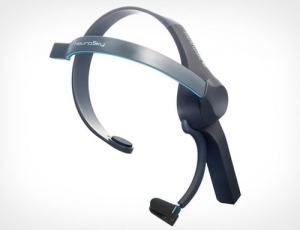 NeuroSky Mindwave Mobile lets you play games with the power of your mind!